Mother Nature really showed us who was in charge today as teams faced high winds and muddy water in some parts of the creeks. TVA was pulling water pretty steady all day and the high water levels created a lot of floating debris to avoid. 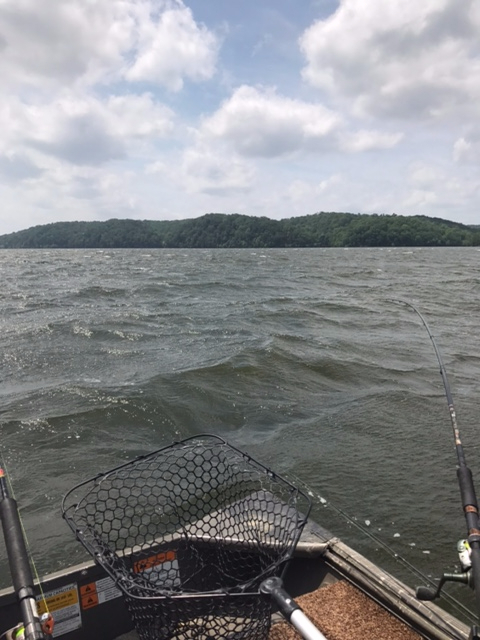 Started the tournament day off with winds of 11-14mph gusting to 18 and by the end of the fishing day the winds were showing steady 21mph out of the south, and it was rough on the open water for sure. Despite all the wind and high water all the teams brought fish to the scales, maybe not the quality fish they had found pre-fishing but conditions changed during the week. 1st place went to Rick Robinson and Kevin McCarley with 8.27 lbs and also had big fish of 1.78 lbs. ( just edging out Keith and Darrell's big fish of 1.76 ). This team fished a more remote area and battled equipment failure during the day as the trolling motor steering cable broke - so they really were at the mercy of the wind for a big part of the day. Good job overcoming the adversity. 2nd place went to Keith Dodd and Darrell Keil with a weight of 7.64 lbs - they were long lining with BnM Crappie Poles and Road Runner jigs in 12-14 fow. 3rd place went to Joe 3rd place Lambert with weight of 6.44 lbs. It appeared that Joe battled the high winds and also pulled jigs. Joe says he used Crappie Slider Jigs and Lake Fork Live Babby Shad in blue/black color. The other McCarley team tightlined and pulled jigs today in 10-13 fow with BnM Crappie Poles using Road Runner heads and Crappie Slider grubs in black/chartreuse color.